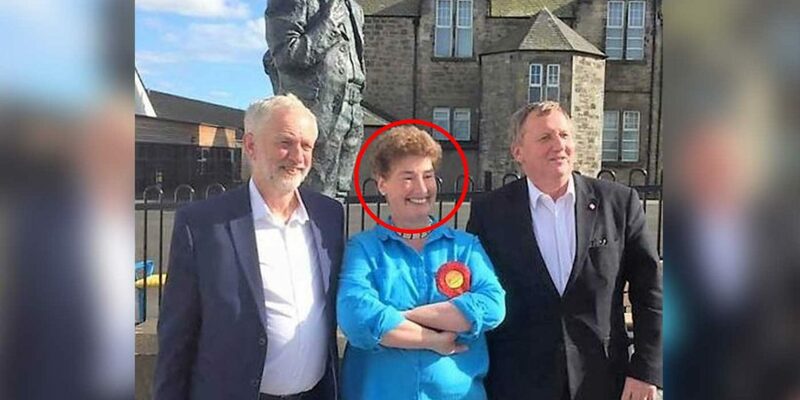 The Labour party have suspended a councillor in Scotland after she accused the three main Jewish Newspapers in the UK of working on behalf of Mossad. CUFI has discovered further posts on her Facebook page which show her ongoing hatred of Israel and how it has morphed into anti-Semitism. After a Jewish schoolgirl spoke on TV how she is called a “stupid fat Jew” and told she “should be gassed” by school friends, Lockhart claimed the girl was subjected to “frightening brainwashing” after the schoolgirl said she felt Corbyn was responsible for it. Lockhart liked a comment from a friend who railed against Jews having their own word, anti-Semitism, to refer to Jew-hatred and that this “singling out” was itself racist. Lockhart claimed that those speaking out against Labour would be “inciting hatred” if Labour was itself a race. Mary Bain Lockhart was suspended from Labour after she aired her views on Facebook concerning the three Jewish newspapers publishing identical headlines in a bid to pressure Labour to change its ways. Lockhart wrote in a now-deleted post on Facebook: “If the purpose is to generate opposition to anti-Semitism, it has backfired spectacularly. (I)f it is to get rid of Jeremy Corbyn as Labour Leader, it is unlikely to succeed, and is a shameless piece of cynical opportunism. “And if it is a Mossad assisted campaign to prevent the election of a Labour Government pledged to recognise Palestine as a State, it is unacceptable interference in the democracy of Britain,” Mary Bain Lockhart wrote on Facebook. “Israel is a racist State. And since the Palestinians are also Semites, it is an ant-Semitic State. It is time we stopped propitiating,” she also wrote. Lockhart’s posts sparked outrage and prompted headlines in the Jewish media in the UK. This lead to her suspension from the Labour party and prompted her to delete her facebook post. The elements of this post which are anti-Semitic are numerous. She claims the Jewish community’s actions are “shameless” and “cynical opportunism” and just an attempt to “get rid of Jeremy Corbyn”. She espouses the anti-Semitic conspiracy theory that Mossad (Israel’s secret service) is controlling the actions of the Jewish press (or that Jews work for Mossad), as well as accusing Israel (or the Jews) of “interference in the democracy of Britain”. She then goes on to dismiss the Jewish communities legitimate concerns as just “hysterical claims”. Finally, she calls Israel a “racist” and “ant(i)-Semitic State”. She then said that people should stop “propitiating” the word anti-Semitism. We often hear this argument from anti-Semites that Jews are not the only Semites and that being anti-Semitic is not exclusive to the Jews. Some even go as far as claiming that Jews are trying to claim they are the only “Semites” and that they are “erasing the history of other Semitic people”. This is absolutely false. The word “Anti-Semitism” is by definition “hostility, prejudice or discrimination against Jews”. The term was first used in Germany in 1879 by journalist Wilhelm Marr who was writing against the Jewish people. He used the word “Antisemitismus” to show opposition to the Jews as a people. Jews did not use this word or steal it, the term was originally used by those who hated the Jews and over time the official word for Jew hatred in English became anti-Semitism. In another post from around a week ago, a friend of Lockhart comments how the “genocide of the Palestinian people” is also anti-Semitic. This post was liked by Mary Bain Lockhart. It is important to note that there is no genocide of the Palestinian people and the actions of the Israeli government are not anti-Semitic because the meaning of the word is only used to describe hatred against Jews. In fact, calling Israel’s actions anti-Semitic is in fact itself anti-Semitic. Another worrying lack of understanding Lockhart shows is when she posts about the situation of anti-Semitism in Labour and conflates the outrage over anti-Semitism with “powerful people” not wanting a socialist government. Lockhart does not realise the legitimate concerns of the Jewish community and instead associates the outrage as either being an attack on Corbyn or an attack on the Palestinians. Under the post, a friend asks, “I have no idea why some people seem to think that antisemitism deserves its own separate category” and goes on to say that the fact the Jews have their own word for racism against them is “is in itself discriminatory and indeed racist”. Mary Bain Lockhart liked this post, appearing to agree with this concept. We know that throughout history the Jews have been uniquely persecuted, but Jews are not the only people group who have specific terms for racism against them. The comment also seems to misunderstand race, by linking both “anti-Arab” with “anti-Spanish”, one of which is a race and the other is a nationality which includes many ethnic groups. One of the most shocking comments Lockhart made was just last week, the day after her main post above. Writing about Labour’s anti-Semitism problem she referenced a Channel 4 News segment on anti-Semitism in the Labour party. A Jewish schoolgirl, Evie, is interviewed about the anti-Semitism she has faced. Evie explains how she had had people saying they are going to “gas” her, that school children have asked her if she “smells gas”. She also said that now “Jew” was being used as an insult and how they say “Oh, you stupid fat Jew”. This is a schoolgirl who has been subjected to anti-Semitic abuse. Her reasoning is that Jeremy Corbyn is at fault because before he was Labour leader she was not subjected to this abuse. So how does Mary Bain Lockhart view this interview? Her view is that this Jewish child has been subjected to “frightening brainwashing” which she views as “alarming and wicked”. She then goes on to say how that if the “Labour Left was a race, we could raise charges of inciting hatred”. To dismiss a young Jewish girl’s concerns based on the very real anti-Semitism she has faced is shocking and then to try and use “reverse racism” to argue against it is just bizarre. Let’s not forget that this girl is subjected to abuse because she is a Jew, not because she supports Israel. Also, some Labour anti-Semites have called for the “executing” of Jews. This is not legitimate criticism of Israel, this is hatred of the Jews and it should not be dismissed. Lockhart’s lack of understanding of anti-Semitism appears to stem from her hatred of Israel. And this is why it is so important that Labour adopts the IHRA definition of anti-Semitism in full. We have long argued that anti-Zionism is anti-Semitism. And the more we witness hatred of Jews in the Labour party the more it can be linked with a hatred of Israel. In one post from May 9th she refers to Israel in her “Axis of evil” alongside the US and Saudi Arabia whom she claims are all “States stolen by transnational capital for the profits to be made from war, devastation and death”. Lockhart expresses her “anger and disgust” at Israel’s actions in another post on July 16th where she goes on to say, “I believe the State of Israel as it presently exists is forfeiting its right to international recognition”. This statement is quite strong and only ever levelled at Israel by Israel haters. No one makes such outrageous claims against North Korea, or Syria or any actual human rights abuser in the world. No one calls for that the international community to remove their recognition, or end diplomatic ties or disown them. However, Israel, which is not committing human rights abuses, is subject to such vitriol. 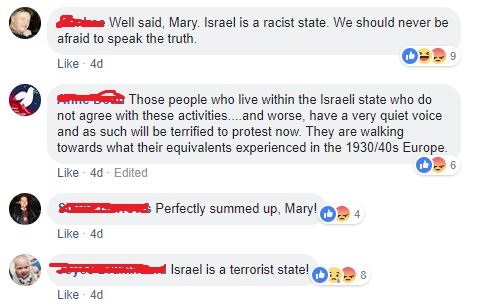 There were some other anti-Israel posts which were also anti-Semitic left on Mary Bain Lockhart’s original Facebook post. We took screenshots of them but unfortunately could not take screenshots to see if Lockhart had herself liked these anti-Semitic comments before they were deleted. Lockhart also revealed that she is also under investigation for anti-Semitism by the Cooperative Party and warned her “friends and Comrades” not to post anything that could incriminate them in this investigation. 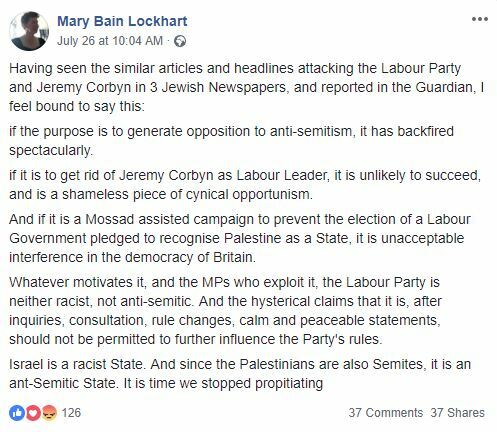 Unfortunately, Mary Bain Lockhart has a misguided view when it comes to Israel and anti-Semitism, both in general society and within the Labour party. Whether she knows it or not, or accepts it or not, she is espousing anti-Semitism. Whether Labour itself understands this is another question altogether.